Jim Rynning was a student studying physics at a large Midwestern university when his studies were interrupted, first by World War II and later the Korean War, a military career, and a family. Now 89, Rynning has completed all of the upper-division physics courses at the University of Colorado at Colorado Springs, earning the respect of students and faculty alike. 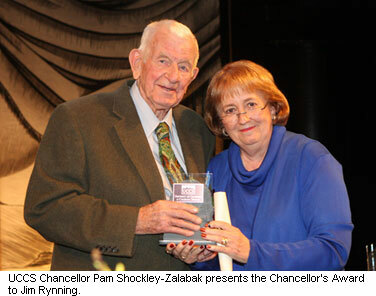 He recently earned a special Chancellor's Award for his demonstration of lifelong learning. "Jim is simply amazing," said James Burkhart, associate dean of the College of Letters Arts and Sciences and professor of physics. "He not only goes to class, but he sits in the front row and even laughs at the professor's jokes." At nearly six feet tall and sporting a white crew cut, Rynning is a fixture on the UCCS campus, completing courses in history, physics and philosophy for more than a decade as well as being an active participant in Curiosity Unlimited, a campus-based program designed to improve interaction between the public and university faculty. "Monday, Wednesday, Friday and Saturday, I open the downtown YMCA at 5 a.m.," Rynning said. "Tuesdays and Thursdays are my university days." Rynning participated in a "listening in" program offered by the university for senior citizens. It allows individuals over 55, on a space available basis, to participate in college courses, usually by listening to faculty lectures and participating in discussions. Rynning not only participated in class discussions, but also completed assignments and took required tests. More than once, he bought books as gifts for his classmates, some of whom are 70 years his junior. Rynning wouldn't have had it any other way. "I butter up the guys with a calendar or something and the ladies with candy," Rynning said. "It's not a problem." What's next for the retired Air Force colonel who cruises Colorado Springs in a yellow VW bug? "I hear they've got some new courses in quantum mechanics," Rynning said. "I'll be back next fall."